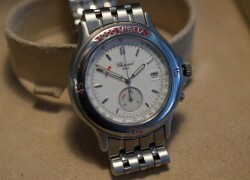 Item description: Chopard have been the official timekeeper and sponsor of the Mille Miglia since 1988. 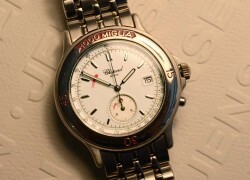 It was with this honour in mind, that Chopard launched their first ‘1000 Miglia’ range of watches in 1988. This example, is a first edition dating from 1988. The watch has a brushed and polished stainless steel case, along with a wide polished bezel bearing a ‘1000 Miglia’ designation. The watch has a clear white enamel dial with tachometer scale to the edge, sub 30 minute indicator at 6.0, and calender at 3.0. 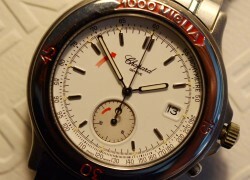 A single button chronograph pusher is situated at the 4.0 position, and this starts, stops, and resets the seconds hand. The screw on case-back has three drilled insets allowing for removal with a special tool. 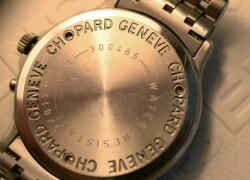 Chopard signed quartz movement to the inside. 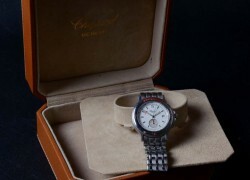 Additional description: In addition to the watch, is the original tan leather case, along with white cardboard storage box. Condition report: Storage age only. The case showing signs of storage use only. Background to Chopard: Louis-Ulysse Chopard, a Swiss watchmaker grew up in Sonvilier, a town near Bern. In 1860, he established his L.U.C manufacturing company in Sonvilier, primarily making movements for other manufacturers. Having realised it was more profitable to market the finished watch than to just make the mechanical movement, Chopard began to produce completed timepieces, selling them throughout Europe. Chopard’s watches were held in high regard, and he became supplier to Tsar Nicholas II of Russia. After Louis-Ulysse Chopard’s death in 1915, the company was taken over by his son Paul-Louis and grandson Paul-André. The company specialised in making pocket watches and ladies’ wristwatches. In 1921, Paul-Louis moved the company operations to a larger town Chaux-de-Fonds in the Canton of Neuchâtel. In 1937, at that time a company of 150 employees, the company relocated to Geneva. This enabled the movements made by the company, to be certified with the Geneva Seal, a mark only applied to watch movements made in the Canton of Geneva. Paul-André took over the company in 1943. In 1963, and with no children wishing to take over the business, Paul-André Chopard sold Chopard to Karl Scheufele III, a German goldsmith and watchmaker from Pforzheim, who was seeking a watch movement manufacturer exclusively for his own business. In 1974, the Chopard factory moved from the center of Geneva to Meyrin-Geneva and in 1976 the company launched, what was to become their signature watches; Happy Diamonds; free-floating diamonds behind sapphire glass. 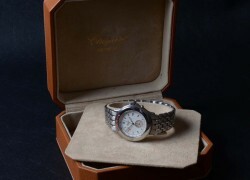 In the 1980s, the company expanded into making sports watches for men and diamond jewellery for women. 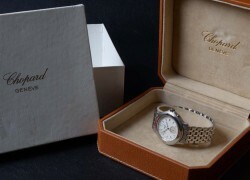 In 1988, Chopard managed to become official sponsors for the Mille Miglia classic car rally. From 1998, Chopard have sponsored the Trophée Chopard prize (actually making the Palme d’Or trophy) for the Cannes Film Festival and since 2002, have become the official timekeepers for The Historic Grand Prix of Monaco. Special notes: This watch looks particularly good with a tan leather strap.